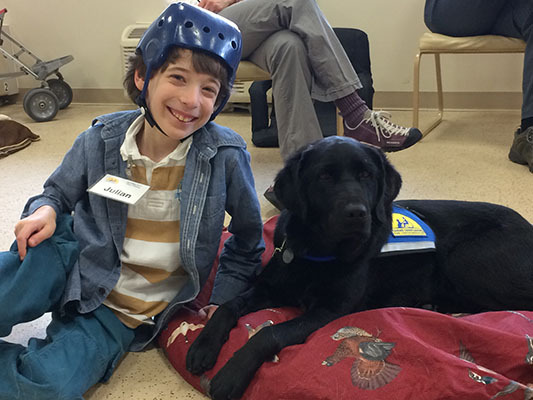 Julian Senick Kaimann, who has cerebral palsy, arrives at school each day thanks to Gemini, a specially trained black lab-golden retriever mix with a can-do spirit. Gemini retrieves 12-year-old Julian’s braces and helps him dress. Once Julian is ready to go, Gemini carries his heavy book bag to the curb, where it is loaded onto the school bus. “Gemini has made a tremendous difference in our son’s life,” says Julian’s mother, Jennifer Senick, executive director of the Center for Green Building of the Edward J. Bloustein School of Planning and Public Policy at Rutgers-New Brunswick. Julian’s self-confidence has increased since the family acquired Gemini last May, she says. The dog helps him master motor planning, a skill that most people don’t think about. Before Julian gets up from a chair or goes through a doorway, he decides what he wants Gemini to do, then coordinates his movements with the dog. An increasing number of Americans have teamed with assistance dogs like Gemini since Congress passed the 1990 Americans with Disabilities Act (ADA) prohibiting discrimination in employment, housing and public access. About 56.7 million Americans—19 percent of the population—have a disability, according to the 2010 U.S. Census. More than half report a severe disability: About 2 million are blind and another 1.1 million deaf. About 15.5 million have difficulty preparing meals, placing telephone calls or handling other routine activities. In many cases, an assistance animal can help. New Jersey has long been at the forefront of the assistance-dog movement, thanks to Morristown-based The Seeing Eye, the world’s first guide-dog organization. A blind man, Morris Frank, founded The Seeing Eye in Tennessee in 1929. The organization moved to the Garden State in 1931. New Jersey’s “cooler weather and varied traffic patterns are ideal for preparing guide dogs for urban as well as rural settings,” explains Peggy Gibbon, the foundation’s director of canine development. The nonprofit has trained more than 17,000 guide dogs for visually impaired Americans and Canadians as young as 16. At Merlin’s Kids, a nonprofit in Midland Park that relies solely on direct donations, rescued dogs are rehabilitated and trained as service animals for children on the autism spectrum or with other special needs, as well as veterans. In such cases, a dog can be taught to nudge the person as a reminder to eat something or take other steps to avert a seizure. The dogs can also be trained to alert other people, retrieve telephones and, in some cases, use a special device to notify 911. Similarly, Wolfe has trained dogs to recognize increases in the stress hormones of children with autism, who experience meltdowns because of sensory overload, unexpected changes in routines or other triggers. Instead of running away, the child is guided by the dog to a safe, calm place. Javier Robles gets an assist from his service dog, Delbert. The dogs can also intervene with an autistic child who flaps his or her arms, becomes fixated on objects or engages in other behaviors that prevent the child from learning and socializing. Javier Robles has enjoyed the companionship of an assistance dog since 1991. Robles, who suffered a spinal injury when he fell out of a tree at age 16, has worked with three dogs trained by Canine Companions for Independence. Now 52, he lives with his wife in Edison. Robles is one of about 200 members of the Garden State chapter of Canine Companions, the largest provider of assistance dogs worldwide. Now Delbert, Robles’s third dog, is the unofficial teaching assistant of the course he teaches in sports science at Rutgers University for students who are planning careers in the health professions. The mild-mannered yellow lab opens doors, adjusts lights and delivers homework assignments, enabling Robles to concentrate on his lectures and students’ questions.